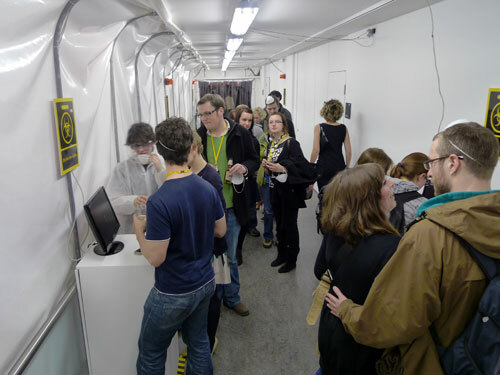 Last week we deployed a new SocioPatterns experiment at the “Infectious” exhibition in the Science Gallery at the Trinity College in Dublin, Ireland. The following movie is a teaser for the exhibition. 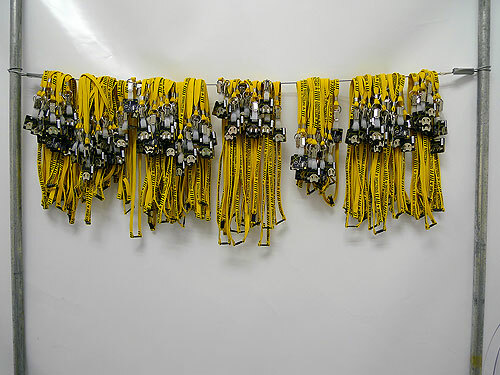 All visitors of the exhibition get to wear SocioPatterns/OpenBeacon tags during their visit. For this exhibition, the firmware has been enhanced to support a “virtual contagion” process. 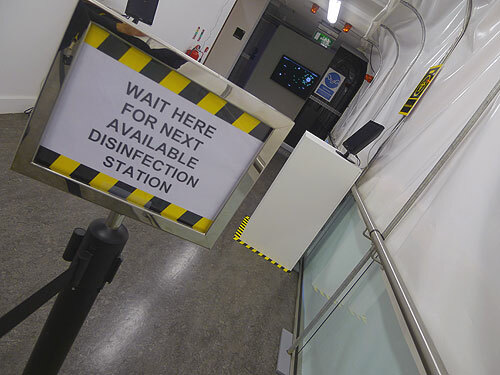 When visitors enter the exhibition their tags are initially “uninfected”. A tag can get “infected” if the person wearing it spends time in the vicinity of an “infected” person. Infected tags have a different blinking pattern and show up as red marks in the real-time visualization available to the visitors, as opposed to green for uninfected ones. This deployment also features a reactive part that involves audio-visual effects triggered by the proximity of individuals. Various visualizations of either the whole interaction network or contextual subsets, are located throughout the exhibition. The following is an extract from the April 16 journal on the national Irish TV (RTE) that should give you an idea of the exhibition in general and the theatrical framing of the tag distribution process, as well as (the current state of) the alarm effects in the tunnel. The following video offers a nice overview of the complete exhibition, starting with the SocioPatterns deployment. Also have a look at the exhibition guide superbly designed to look like a government emergency procedure leaflet. This particular SocioPatterns deployment clearly has a high “drama” component to it. It is, however, also scientifically relevant. In particular the fact that it involves a continuous stream of visitors entering and leaving the exhibition is of interest. Such “high-flow” setting is akin e.g. train stations or airports. A better understanding of the structural and temporal nature of social interaction patterns in such high-flow settings is relevant in a number of domains, including epidemiology. Clearly, collecting detailed data on these patterns in an actual train station or airport is very difficult. The relatively controlled and approximating settings of this exhibition does however provides us a promising opportunity to indeed collect such data. 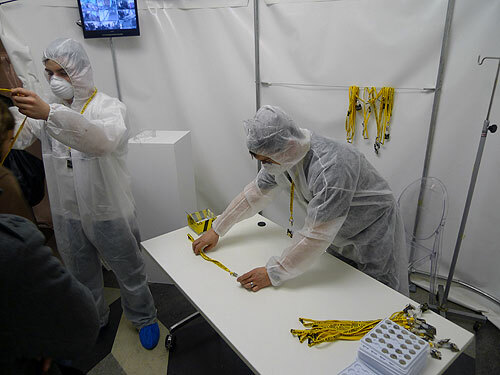 The SocioPatterns deployment at the Infectious exhibition includes a “live” simulation of contagious spreading. By framing this functionality as a “game” and controlling the nature of the information that is provided to the visitors in different runs on different days, we hope to collect data on and compare different kinds of behavioral effects. 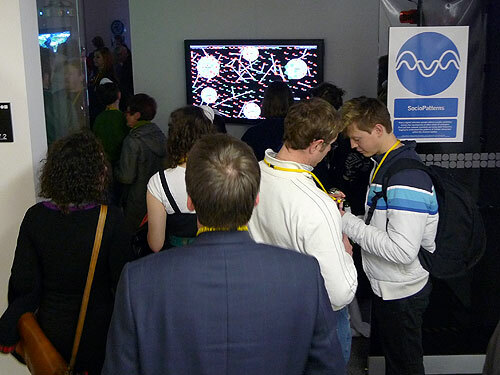 This project has been deployed by Ciro Cattuto and Wouter Van den Broeck in collaboration with the Science Gallery. We would like to thank Michael John Gorman, Don Pohlman and Derek Williams from this great venue for making this possible. We would also like to thank Milosch and Brita Meriac from OpenBeacon.org for once again providing excellent RFID hardware, and the ISI Foundation for their continued support. To wrap up this post, we would like to share some pictures taken at the exhibition. A bunch of RFID tags ready to be distributed at the entrance. Handing out the RFID tags. 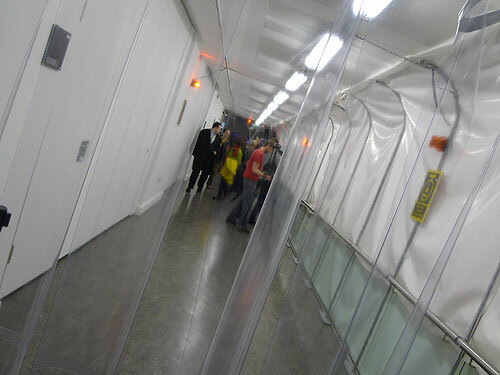 The tunnel contains alarm effects triggered by nearby infected tags. Nearing the end of the tunnel with the disinfection stations. Queuing to get healed at the disinfection stations. The visualization at the end of the tunnel during the crowded opening event.